How Much Does a Pool Cover Replacement Cost? 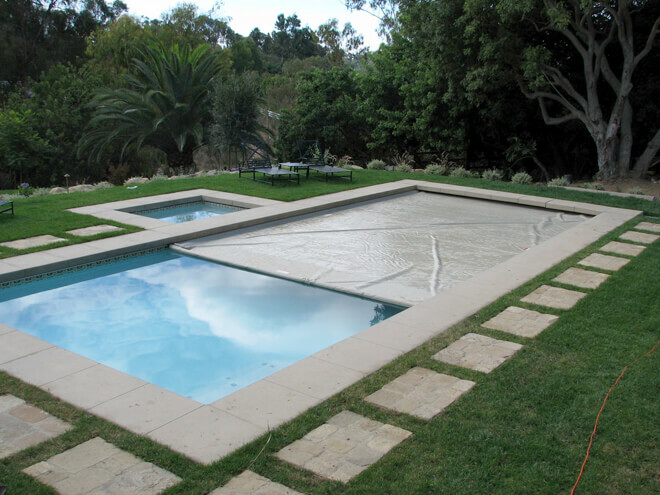 One of the most crucial accessories you can have for your pool is a cover. When trees and flowers shed their leaves and bugs come in for a drink, the surface of your pool can quickly become littered with debris. If you find a reasonably priced estimate, it makes total sense to invest in a pool cover replacement right away. The cost to replace a pool cover can vary quite a bit, depending on the type of pool you have, its size and the neighborhood where you live. Once you have a new and well-functioning pool cover in place, you'll be able to really enjoy your time spent outdoors lounging by the pool instead of having to clean it every day. How Much Will It Cost To Replace a Pool Cover? You should expect to pay anywhere between $100 and $2200 to replace a pool cover, depending on your particular situation. The average cost for a pool cover replacement is $700, but a conversation with a trained pool servicing contractor will help you arrive at a precise understanding of costs. Pool cover installation is really just a standard part of being a responsible pool owner. When you consider how much time and money you could be spending on a regular basis just keeping up with pool maintenance, the incentive to pay once and replace a functioning pool cover system seems like a no-brainer. Failing to address the impact of mother nature on your pool, over the long haul, can lead to additional problems like needing to replace your pool's filter system. Regardless of the type of pool cover replacement you choose for your backyard oasis, the way to get the job done right, and at the best price point, is to hire a local and qualified professional pool specialist. Compare estimates from multiple experts for an even better rate. Mesh covers: Easily the most affordable type of cover, these can be installed quickly and can be put on and removed according to your needs. Winter covers: Depending on the quality of your seasonal cover choice, having a winter pool cover replacement is a sure-fire way to keep your pool ready for Summer fun. Solar-heating covers: By far the most valuable pool cover types, these covers offer more than protection from debris. With their having the ability to warm the water in your pool, these covers pay for themselves. You can simply enter your home zip code into the space provided on this page to request a FREE estimate. A local pool cover replacement professional in your area will contact you with a no-obligation, 100% FREE quote on the cost to replace your pool cover. Enter your zip code to take advantage of this free offer now!